An expansion of the Paramount Series acoustic guitars, the PM-3 Triple-0 All-Mahogany acoustic guitar combines simple styling with an organic finish to create a highly responsive instrument. Carefully crafted for superior tone, high performance and earthy visual appeal, this premium instrument will satisfy all players searching for an inspiring guitar. Fender used solid mahogany back and sides with a solid open-pore mahogany top to make this guitar the perfect platform for dynamic performance and self-expression. 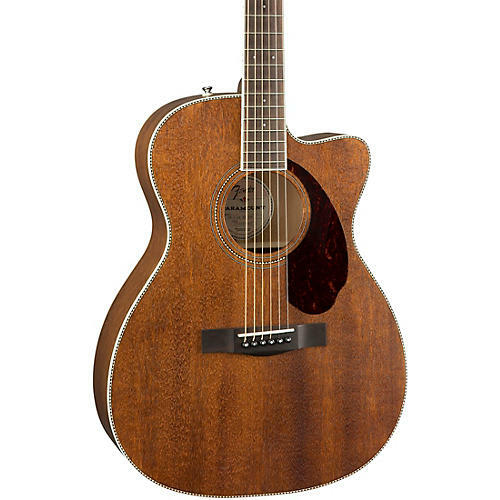 The PM-3 Triple-0 all-mahogany acoustic guitar's all-solid construction contributes to a mature voice, with a body that vibrates freely and resonates more naturally. Inspired by classic ‘60s Fender acoustic guitar designs, the black-and-white checkerboard purfling offsets the natural beauty of the tonewoods. Most importantly, they evoke a true old-school acoustic vibe, matched with playability for any occasion. The '60s-inspired headstock design serves as a fitting salute to our classic acoustic legacy. Comes with a black deluxe hardshell case.